Please contact us to arrange for our qualified estimators to assess the damage, take photographic images and prepare a complete estimate and list of parts required. If the vehicle damage is your fault / liability we will assist you with the insurance company claim registration. If your insurance company is on our list of authorised insurers we can complete the process. If your insurance company is not on our automatic authorisation list we will contact them to arrange authority for repairs to proceed. A number of insurance companies may try to redirect you to there own repair body shop which may be miles away. Please remember you are entitled to have your vehicle repaired at the repairer of your choice. If your vehicle damage is the fault of another insured person we can assist in arranging a similar vehicle whilst your own is being repaired. If you do not wish to make an insurance claim talk to us and we will help you choose the best options for your circumstances. 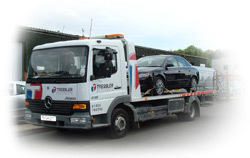 If your vehicle is already on our premises and we have automatic authority the parts required will be placed on order ready for the repair to commence. If you are still driving your vehicle, immediately we have received the insurance company authorisation we will contact you to arrange a suitable booking in date for the repairs to be commenced and arrange a courtesy vehicle if required.